Tank, D.C. and Donoghue, M.J. 2010. 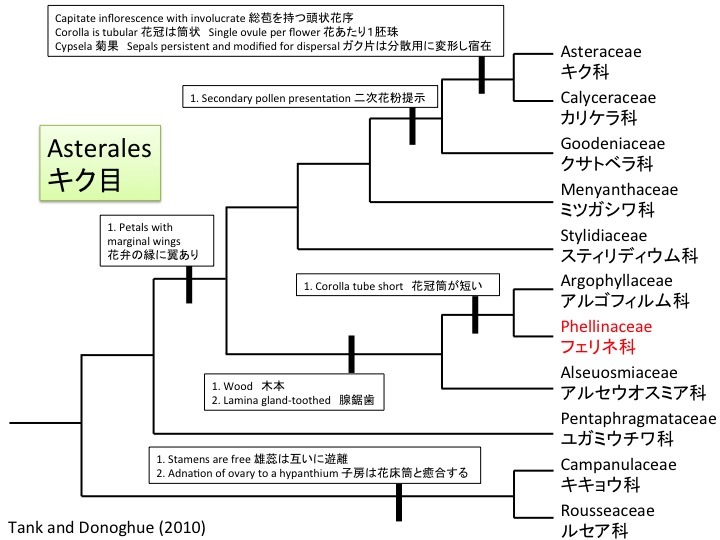 Phylogeny and phylogenetic nomenclature of the Campanulidae based on an expanded sample of genes and taxa. Syst. Bot. 35: 425-441. 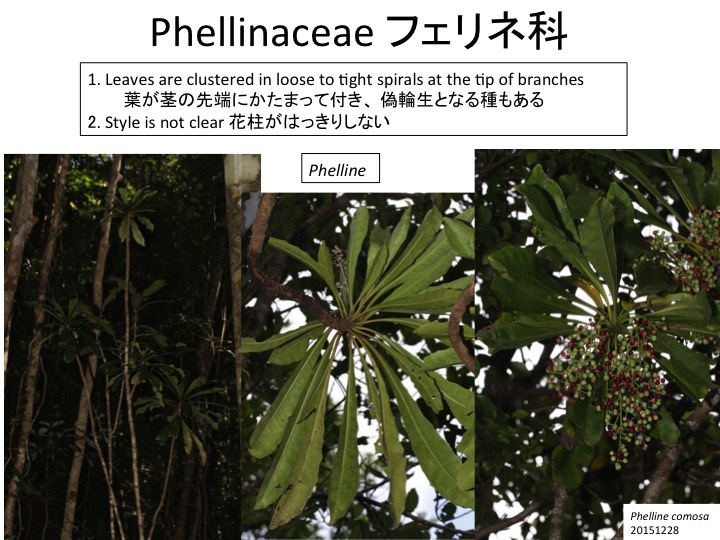 Phelline is monogenic in the Phellinaceae and11 species are known only in New Caledonia (Barriera et al. 2006). Barriera, C., Savolainen, V., and Spichiger, R. 2006. Phellinaceae. Pp. 608-610, in Kadereit, J. W. and Jeffrey, C. (eds), The Families and Genera of Vascular Plants VIII Asterales. Springer, Berlin. 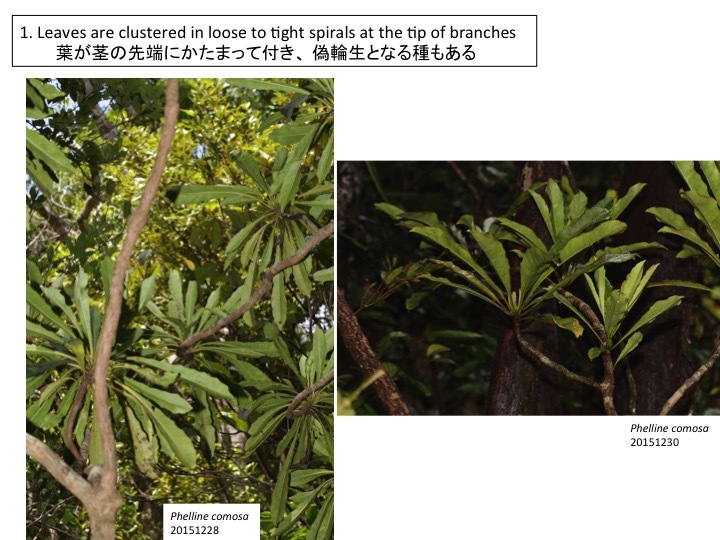 Leaves of Phelline comosa are clustered in tight spirals at the tip of branches. Leaves are alternate but some internodes are longer than other internodes. Phelline comosa has growth and dormant phases. 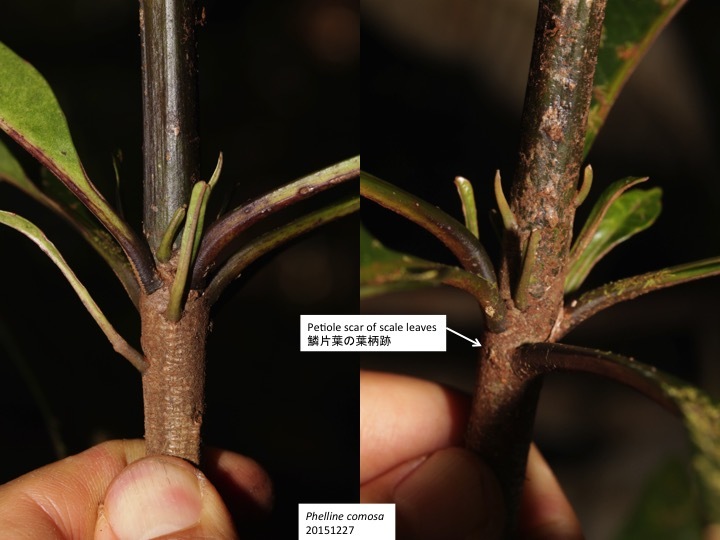 At the dormant phase, scale leaves cover the shoot tip, indicating that Phelline comosa forms scale leaves at the late stage of the growth phase. 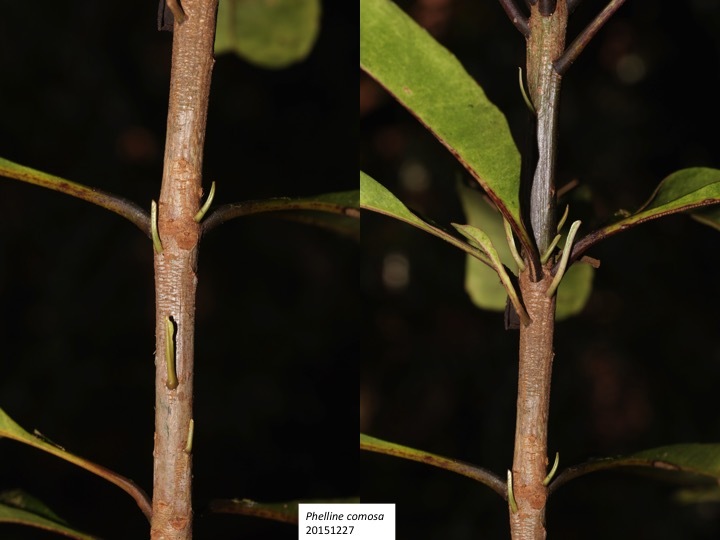 Since scale leaves also locate on the middle and distal parts of internodes, growth of scale leaves formed at the later stage of the growth phase may be arrested and starts again when dormancy is released. Otherwise, scale leaves are formed at the shoot apex when growth starts, before the formation of normal leaves. I could not find any reports on the phenology of Phelline comosa. 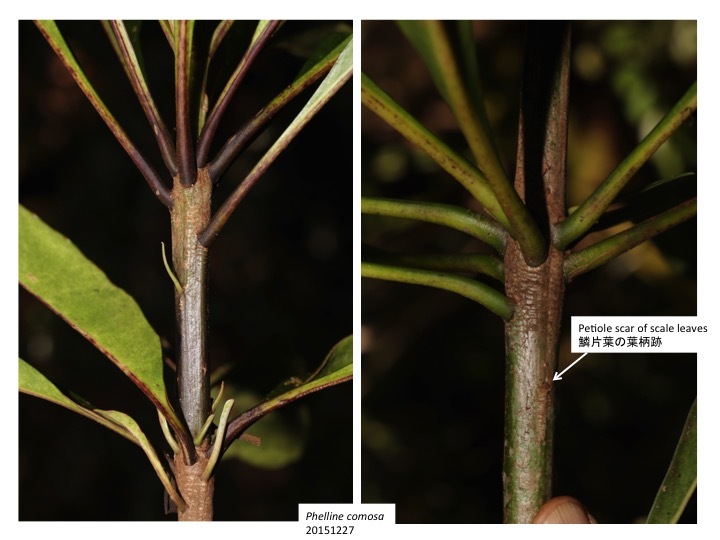 Observation of the shoot apex with microscopy for sections and scanning electron microscopy will reveal the relationship between phenology and heteroblasty. 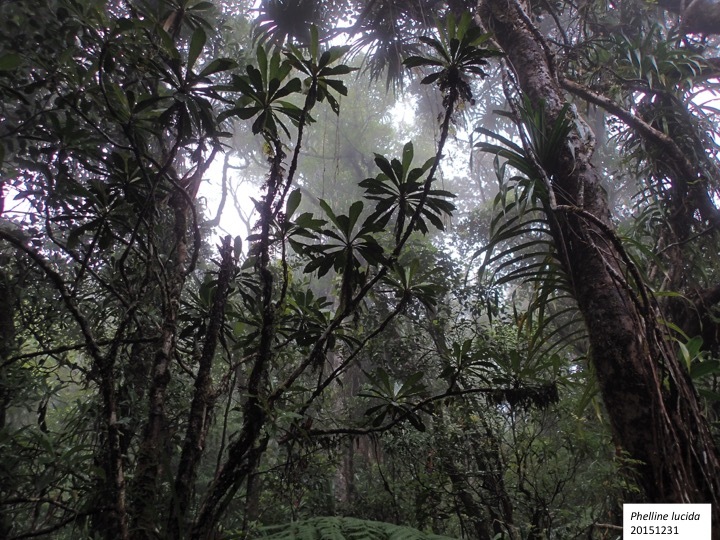 What is the adaptive significance of scale leaves? They should function to protect the shoot meristem from dryness and harmful insects as scale leaves in other seed plants. 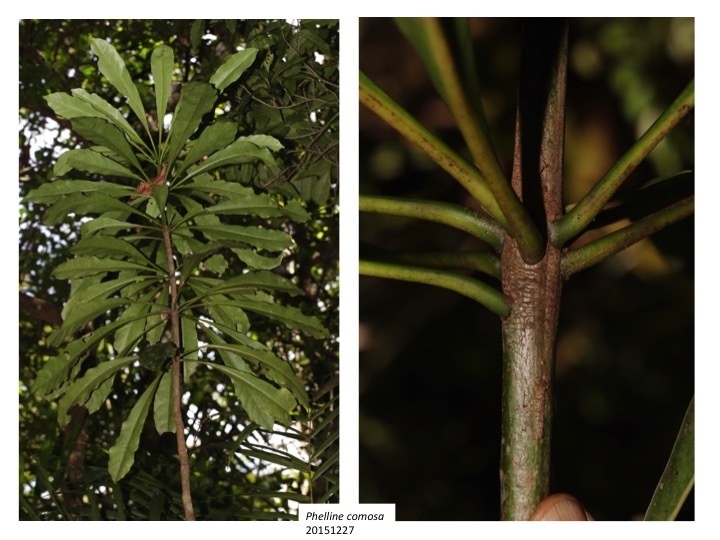 Furthermore, since stems of Phelline comosa are slender and easily shaken by wind, the scale leaves may protect the shoot meristem from collisions to surrounding trees. 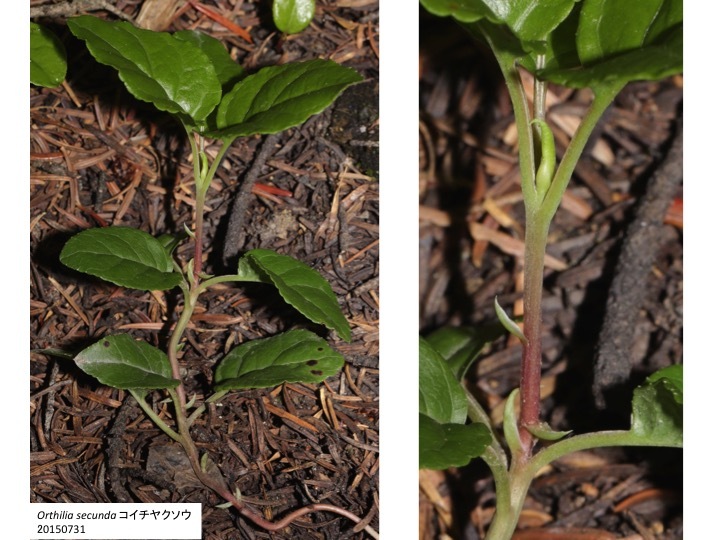 It is unknown whether developmental programs to form scale and normal leaves are similar or different. They may use a similar developmental program, which is arrested at some point in the scale leaf development not to fully make the leaf blade. This is a kind of heterochrony, whose molecular mechanisms are not well known. 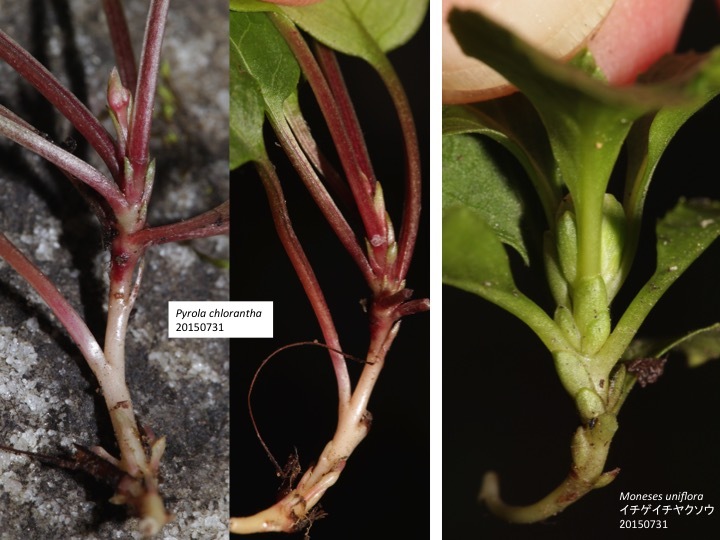 It is often observed in angiosperms that morphology and phyllotaxis of early leaves are different from those of later leaves when winter buds start to grow. Lateral branches usually have prophylls with different morphology and phyllotaxis to regular leaves. 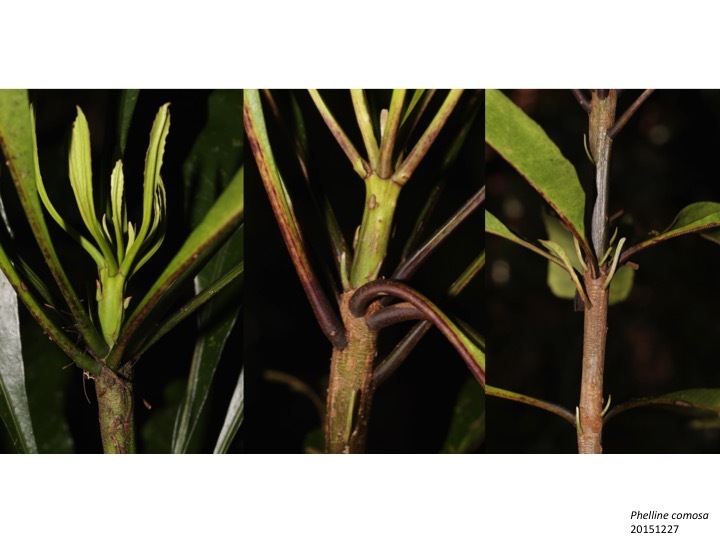 Molecular mechanisms to form such different types of leaves are mostly unknown. 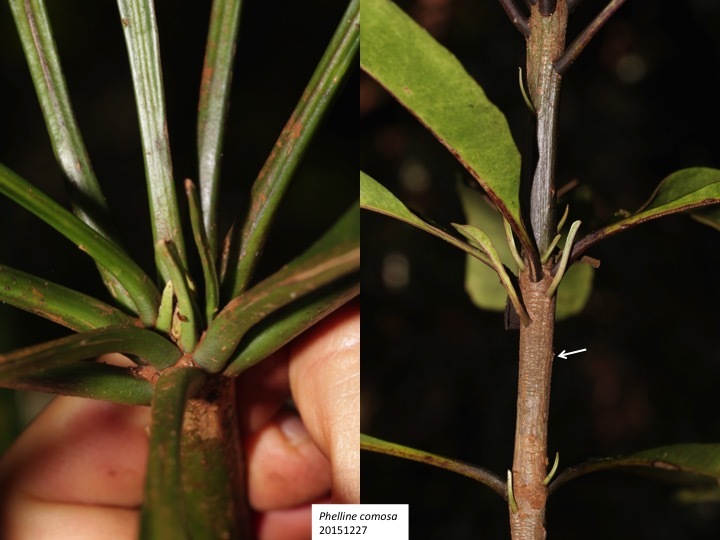 It is also unknown whether scale leaves of Phelline comosa use similar mechanisms. Phelline comosa has growing and dormant phases. Just after the growing phase starts, internodes of scale leaves are extensively grow. Is there a relationship between scale leaves and rapid growth? Internodes of scale leaves are longer than those of normal leaves. Internodes of scale leaves at the base of dormant bud are similar to those of normal leaves. Some scale leaves locate on the longer internodes. 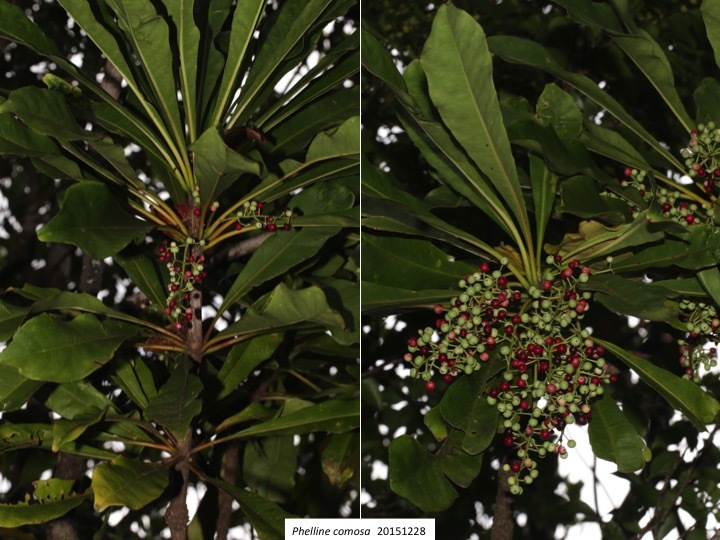 Relationship between scale leaves and long internode is also observed in other plants. 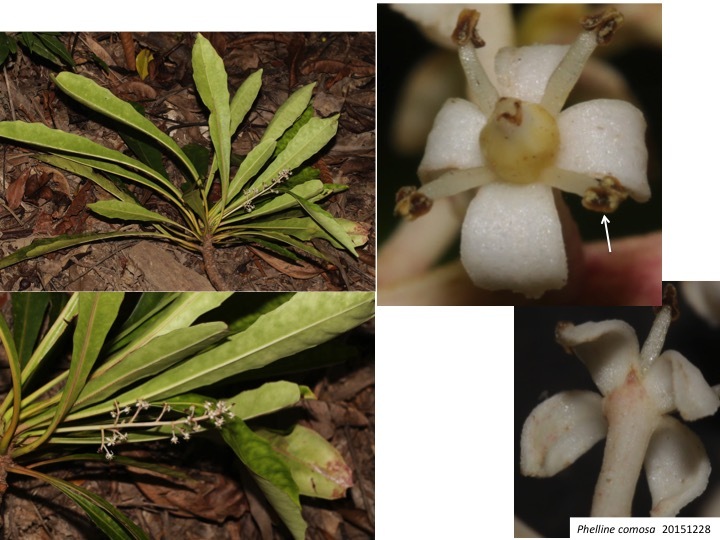 Orthilia secunda (Pyroloideae, Ericaceae) forms pseudo-verticillate leaves and internodes with scale leaves longer than those with normal leaves, as observed in Phelline comosa. Pyrola chlorantha and Moneses uniflora also belong to Pyroloideae in the Ericaceae. Scale leaves and internode growth are related in Pyrola chlorantha, while they are not in Moneses uniflora. 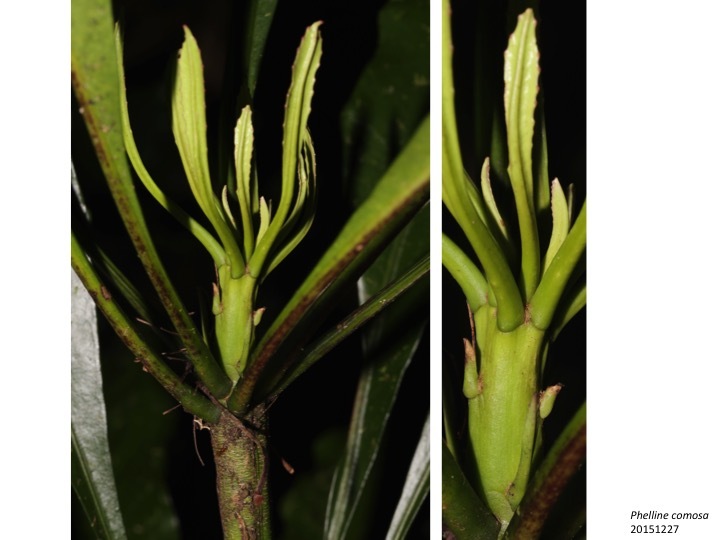 The problem of the relationships between scale and normal leaves in Phelline comosa and Pyroloideae are related to the general questions on the relationships between heteroblasty and internode growth, between leaf and stem morphology, and between long and short branches. 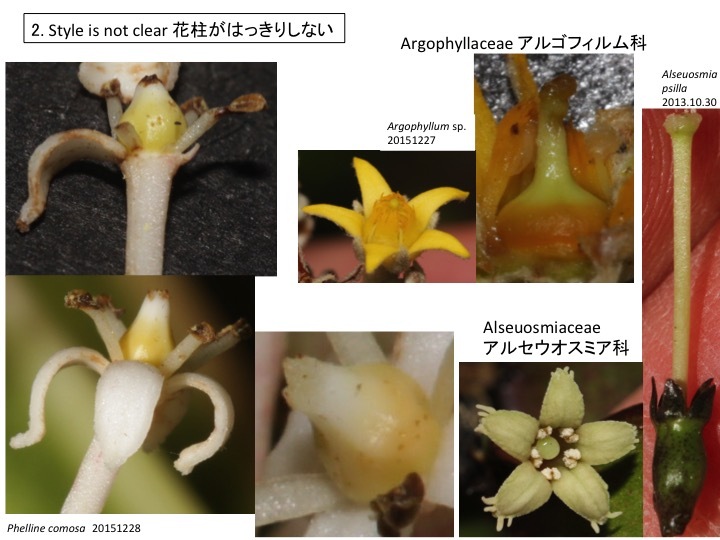 Species in Phelline form axillary inflorescences with dioecious flowers (Barriera et al. 2006). Female flowers of Phelline comosa form both a gynoecium and four stamens, although fertility of the produced pollen are unknown. Style is not clear in Phelline, while that is conspicuous in closely related families, Argophyllaceae and Alseuosmiaceae. Phelline forms drupes. 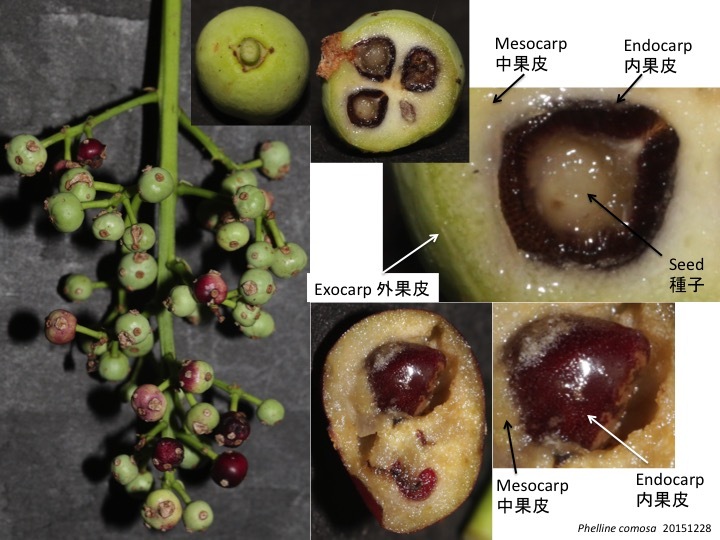 Mesocarp and endocarp are easily separated.